In 1997, NASA’s Sojourner robot became the first rover to explore the surface of Mars. NASA has since launched other successful rover missions, gathering precious information in preparation for an undertaking that has long captured people’s imaginations—a manned mission to Mars. The challenges such an enterprise poses have necessitated new technologies that are not only bringing us closer to the Red Planet, but also improving life on Earth. 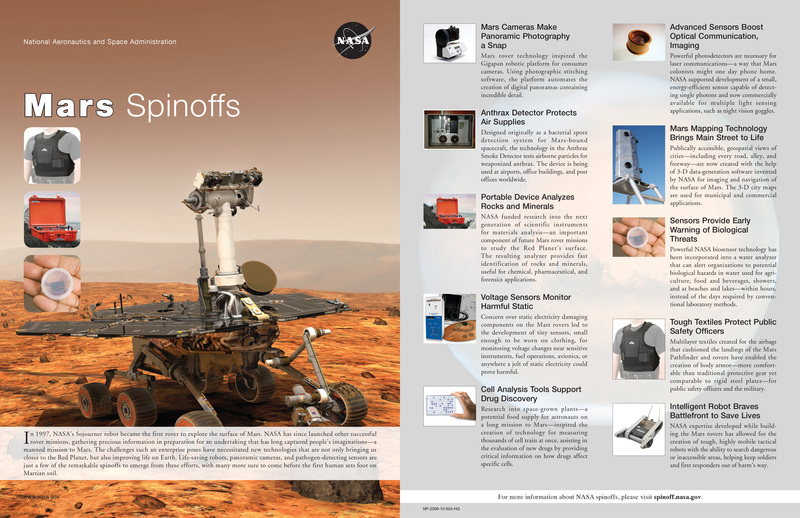 Life-saving robots, panoramic cameras, and pathogen-detecting sensors are just a few of the remarkable spinoffs to emerge from these efforts, with many more sure to come before the first human sets foot on Martian soil.